Zum Schneider F.C. 03 and Lansdowne Yonkers F.C. players during a minute of silence before one of their enounters last year. 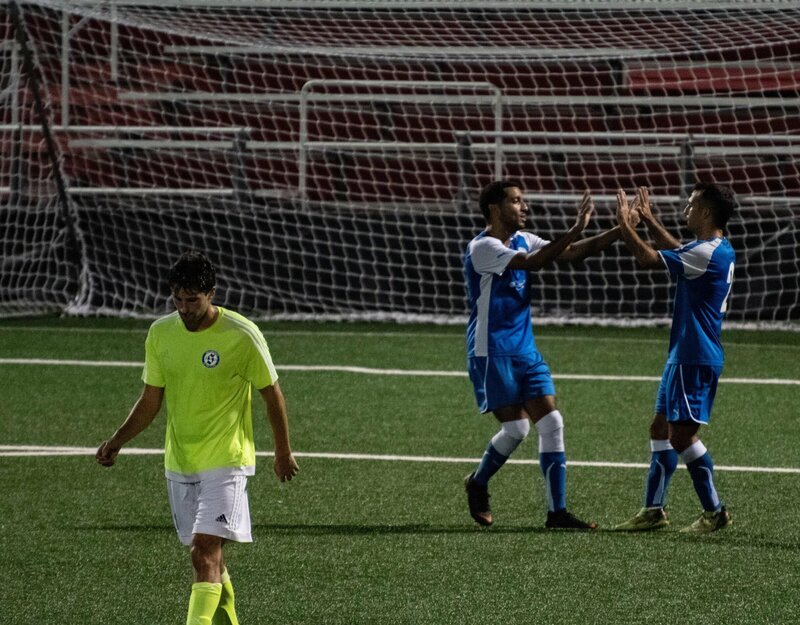 It’s still only Week 5 in the CSL but teams will be fighting for wins like they’re fighting to enter the last playoff spot this weekend--particularly in the old Hellenic Derby between NY Pancyprian Freedoms and NY Greek Americans on Sunday night at the Met Oval. Lansdowne Yonkers F.C. versus Zum Schneider F.C. 03 isn’t a derby but you can bet on Lansdowne to come out in full gear as they will be seeking for their first domestic victory of the season as reigning champions. Promoted side Hoboken F.C. 1912 will look to continue their unbeaten run as they host Shamrocks. Elsewhere in New Jersey, Cedar Stars Academy will fight to add another win to their incredible start of the season against Central Park Rangers Whites at home. The two most decorated active clubs of the CSL will clash this weekend as nine-time champions NY Greek Americans and seven-time titlists NY Pancyprian Freedoms will open a new anticipated chapter of the Hellenic Derby at the historical Metropolitan Oval on Sunday at 8:00 p.m. The Freedoms are enjoying a sensational start of the season as they moved past their rivals Lansdowne Yonkers F.C. in the opening round of the Open Cup qualifying round and are 3-0-0 in their first three CSL outings, which includes another win versus Lansdowne. Although it’s his first season with the Freedoms, Mackie has played in the Hellenic Derby before doing so as a NY Greeks player. The midfielder is keen to play in the heated Derby again on Sunday. “I'm honored to have had the privilege of playing with both teams,” he said, “this time around with the Pancyprians. Gerassimos 'Mackie' Magoulas [left] exchanging a double handshake with a teammate. Mackie leads the team in scoring in the league with three goals in as many appearances. As for NYGA, they’re coming from a promising 4-1 victory over Shamrocks. Charlie Ledula leads the club in scoring after scoring a double in that encounter. Rock bottom placed team Zum Schneider F.C. 03 will host ninth placed Lansdowne Yonkers F.C. at Randall’s Island Field 75 on Sunday at 8:00 p.m.
“I'm not a betting man and I will not give predictions but this fixture of the two "bottom teams " is a pretty safe bet,” Zum’s head coach Alexander Berscheid said. Lansdowne did lose their first two CSL matches but if Berscheid was to bet, perhaps he would’ve betted for the champions to win the encounter. “If you think for one second that we have a chance against the reigning champs just because they dropped a couple of points then you are on the wrong path,” the 48-year-old said. Zum drew with Lansdowne 0-0 last season. Berscheid pointed out that the club had a stronger team then. “We did tie them last season but we had a good coach and the players and the groove to do that. We are far from that team we were then. We don't expect to even stand a chance to gain a single point,” Berscheid said. However the three-year CSL coach is hoping that his players will gain experience from the encounter. “It will hopefully come at the benefit of that learning experience so we can pick up a few points in the second half of the season,” he said. ZSFC is going into the game with a 0-0-4 record and a -15 goal differential. The club’s top scorer of the season so far is Saad Afif, who netted twice. On the Bhoys’ end, they hold a 1-4-0 overall record. Lansdowne summer signing Leo Folla will be going against his former club. Folla played for Zum from 2015 to 2018. Cedar Stars Academy will welcome Central Park Rangers Whites at Capelli Sport Complex on Sunday at 8:00 p.m.
As title favorites, Cedar Stars midfielder Matthew Nigro expressed that he and his teammates are entering the game confident but are also positively pressured. “We are definitely going into games with confidence. And knowing that every team is going to show up to play against us, the pressure just keeps us honest and allows us to stay focused for every game,” Nigro said. The Stars are on a neat 6-0-0 overall record and hold a 1-0 55th minute lead over Lansdowne as their must-see game on Tuesday was postponed due lighting. With former MLSers, ex-college standouts and NY Cosmos B players in their roster, CSA owns the most talented roster we’ve seen in the modern era of the league. Central Park is going into the game winless with a 0-2-2 record and fresh off a 0-0 draw with sixth placed team NY Athletic Club. CSA striker Bledi Bardic is the player to watch in the encounter. Bardic won last round’s Player of the Week and netted versus Lansdowne on Tuesday. Shamrocks kicked off the season with two wins but lost their last two encounters. Their next opponent is Hoboken F.C. 1912 as they travel to Stephen R. Gregg Park Turf Field 1 on Sunday to face Marco Chung’s men at noon. Hoboken didn’t seem to get unfamiliar with the top flight after dropping to the second division for three years prior to this season as the club is riding on a 2-0-1 record and sits in third place. 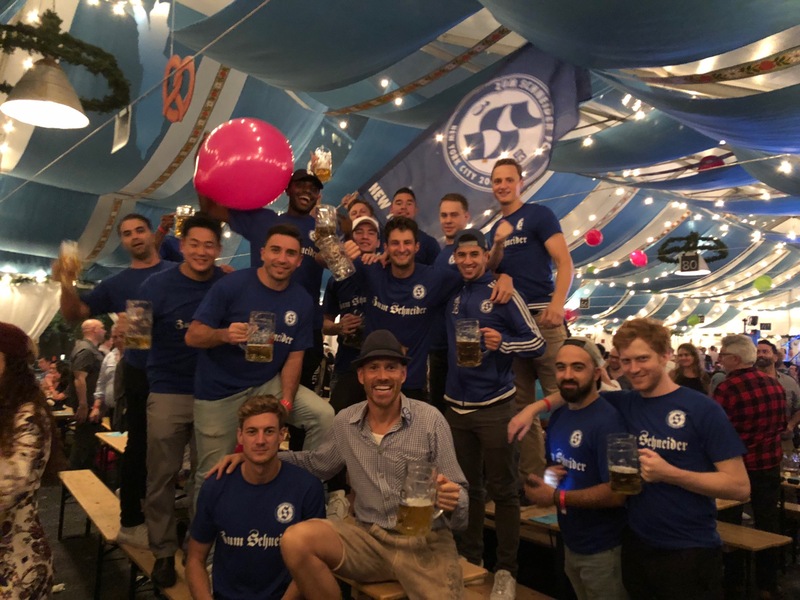 The Jersey team bested Zum Schneider 3-1 last weekend, thanks to Cory Chaplin’s double, who leads the team in scoring with three goals in as many matches. Shamrocks lost to NY Greeks 4-1 in the last round. Left back Dan Giorgi was the Rocks’ lone scorer in that encounter. Doxa S.C. and NY Athletic Club will clash on Sunday at 5:00 p.m. at Sidelsky Field in a fierce mid-table battle. Only two points separate the two sides as NYAC stands in sixth place over Doxa with five points. NY Athletic is unbeaten in three games while their Greek opponents lost their last match to Cedar Stars 7-1. “I definitely think it's important, especially early in the season, to start building momentum as quickly as possible,” head coach Jimmy Lannon said about the team’s undefeated run. 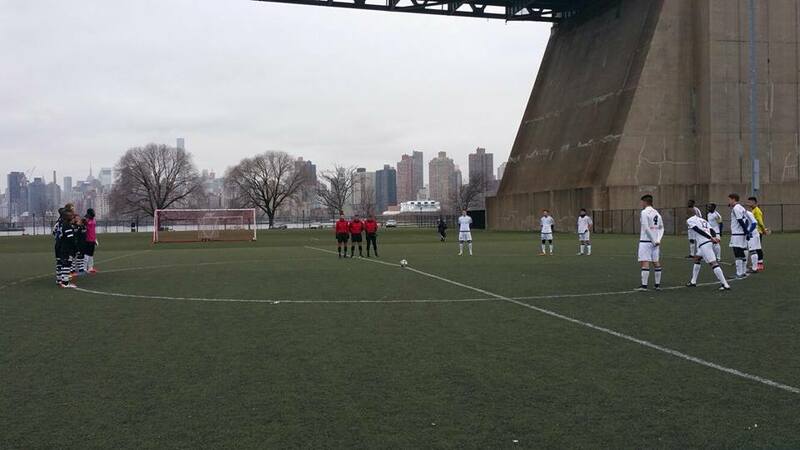 NYAC fell to Doxa 1-0 at home last season but won the away fixture 3-2. Lannon touched on how tough it is to play against Paul Grafas’ men. “We know that every game in this league poses a great challenge and Sunday will be no different. Our final game against Doxa last season was a battle and we expect nothing less from a well-organized, spirited side. We're excited for the opportunity and look forward to the challenge,” he said. Jake Mann and Rafik Mekhaldi leads NYAC in scoring, tallying two goals each. Kareem Joachim is Doxa’s top scorer with five goals.